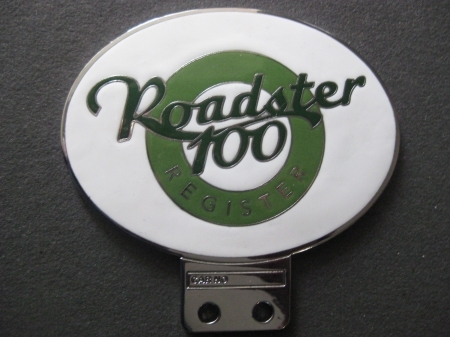 New 'Centenary Roaster 100 Register' Badge. 'Hot off of the Press' only Yesterday, just in time for Waddesdon Manor event. That's a nice looking badge Frank, have you limited the quantities to the number of cars produced? Did you find the company who produced it? what do all the people that buy these magnificent badges do with them? badge bars only hold just so many items? what is the thinking behind the badge? does it mean...I have one? or I have been there too? or this is one and I love it? Badge collecting can be an obsessive disorder which provides a lot of pleasure. I don't see myself as a collector, although I have more badges than the three on the Morgan and have bid for, and lost a couple on e-bay. Clearly I have positive signs, which are under control. I only buy what I like the look of, so I'm resisting the temptation to try to collect all the MOG event badges back to the year dot, although quite a few have been for sale recently. I intend to remodel my badge holder so that I can fit a few more to the Morgan, but will wait for the MSCC Diamond Jubilee badge before doing that. I saw the design today at the NCM, and it's delightful. Avid collectors will be seeking the Centenary Roadster badge pictured above, then there will be the Newmarket badge and the Mog2012 badge available later this year, so plenty to keep the collectors happy. I imagine that there are a few with wall cabinets for display purposes, and why not. I haven't yet located a Neoprene Appreciation Society car badge, or a Black Leather Offcuts Collector badge but I live in hope. a Black Leather Offcuts Collector badge but I live in hope. Is this also know as the Village People Y.M.C.A. badge?! As per my comments on the Waddesdon thread; having seen the R100 badge in the metal, I can tell you that it is a quality item - really nicely designed and produced. I took your lead and decided to Google 'Black Leather' and 'Neoprene' but won't tell you what I found!!! The badge design started as the banner design donated by David, husband of Helen Thorne of Richard Thorne Morgan. 'Premier Badges' (who made the Buxton badges among others) converted it into a Car Badge for me. I ordered 30 based on pre booked requests from 25 Register Members whose badges were Numbered. I have already sold all of the spares but need to find out if singles or extra orders are possible as we have paid for the Die to be made. Knowing that you are trying to trace the 100 Roadsters I noticed that Perranwell Morgan have one for sale and could maybe ask the new owner to contact you. Failing that they maybe will join TinMog if sold locally.